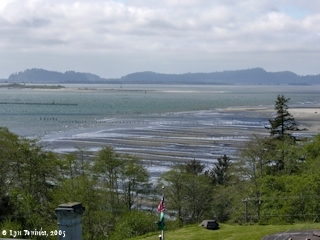 Click image to enlarge Baker Bay from Chinook Point, Washington. At high tide. Image taken April 19, 2005. Baker Bay, Washington, is the first large indentation on the Washington side of the Columbia River after passing Cape Disappointment. 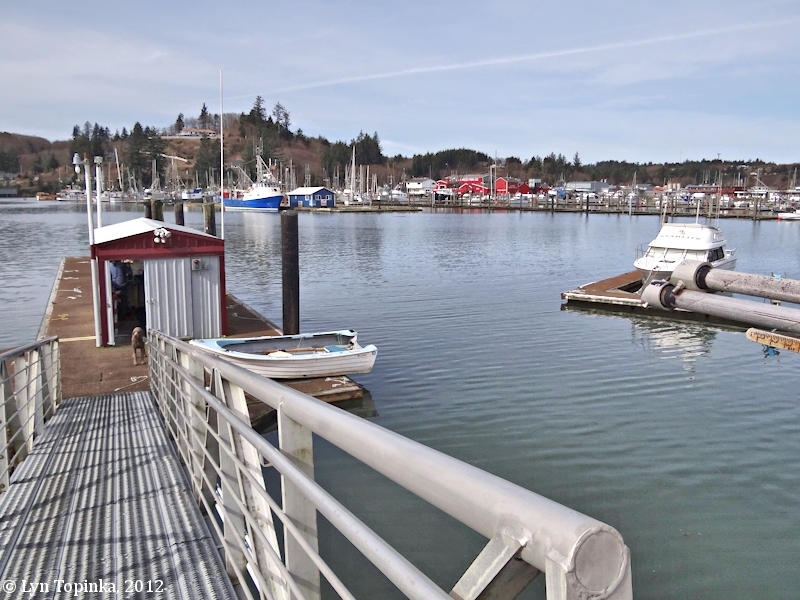 The town of Ilwaco, Washington is located inside of Baker Bay, as well as the mouth of the Wallacut River and the mouth of the Chinook River. 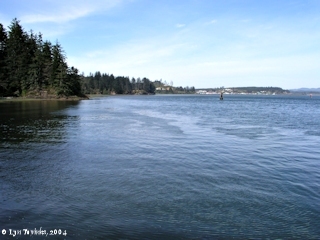 The upstream end of Baker Bay is at Chinook Point, home of Fort Columbia and Fort Columbia State Park. At the entrance to Baker Bay is located Sand Island. The name "Baker Bay" comes from 1792, when William Broughton, of the Captain George Vancouver expedition, named the bay, "Baker's Bay", after a British merchant, Captain James Baker, whose ship was anchored inside the Columbia's mouth when Broughton crossed the bar to explore the river. As Lewis and Clark left their Megler camp and rounded Point Ellice, they reached a spot which was to become Station Camp. They saw Baker Bay in front of them, with Cape Disappointment in the distance, and Point Adams across the way. 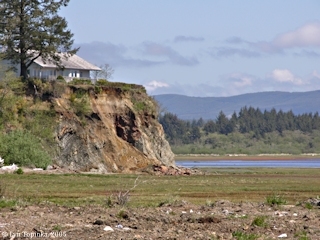 They called the bay "Haley's Bay", after the Indians favorite trader, as reported, had anchored in the protected inlet behind Cape Disappointment. Lewis and Clark named Baker Bay "Haley's Bay" on November 15, 1805. 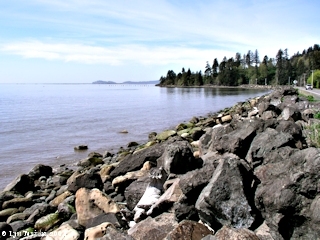 At the eastern end of Baker Bay is Chinook Point, the location of Fort Columbia State Park. 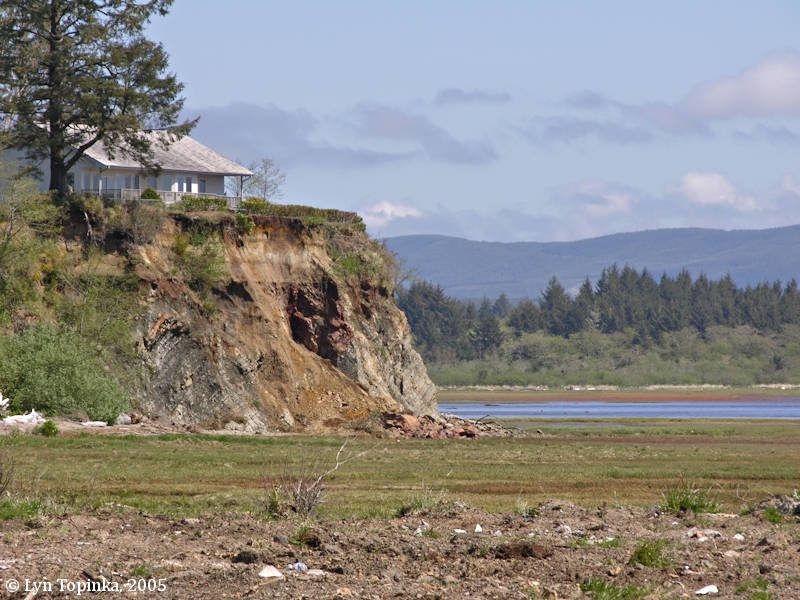 At the western end of Baker Bay is the Washington community of Ilwaco and Cape Disappointment. Click image to enlarge Looking downstream from Station Camp. Chinook Point is visible on the right, with Baker Bay just behind. Cape Disappointment is in the far distance. Image taken April 9, 2004. Click image to enlarge Baker Bay, as seen from Chinook Point, Washington. View from outside Fort Columbia State Park. Image taken April 9, 2004. Click image to enlarge Baker Bay, as seen from Chinook Point, Washington. View from outside Fort Columbia State Park. Image taken February 19, 2005. 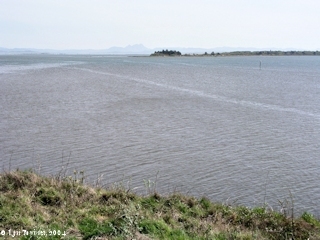 Click image to enlarge Baker Bay from Ilwaco, Washington. At low tide. Saddle Mountain, Oregon, is visible in the distance. Sand Island is on the right. Image taken April 9, 2004. 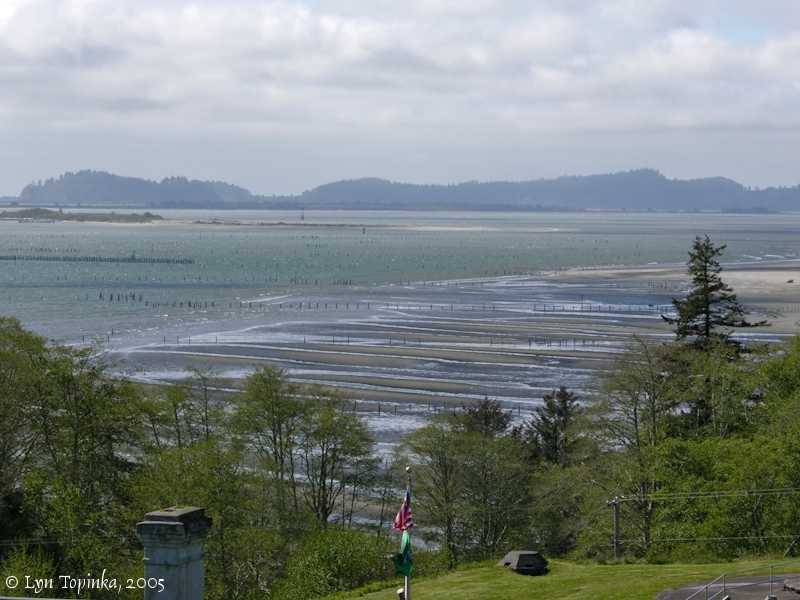 Click image to enlarge Baker Bay and Ilwaco, Washington, from Cape Disappointment. Image taken April 9, 2004. 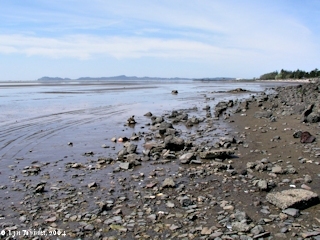 Click image to enlarge Baker Bay from road to Cape Disappointment. Image taken November 9, 2005. 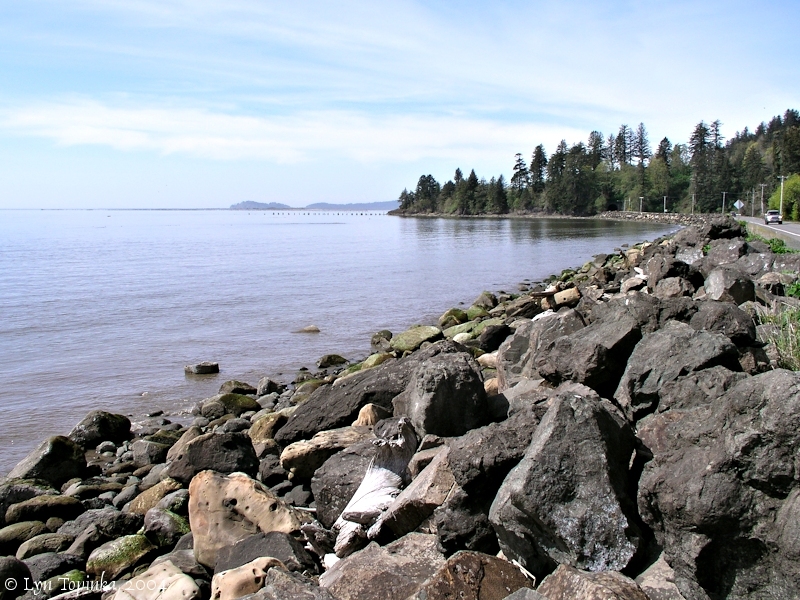 "... Baker's Bay lies between Cape Disappointment and Chinook Point. It runs 2 1/2 miles to the northward of the cape, and receives the waters of the small streams which head toward Shoalwater bay, and connect with it by a small portage. The western and largest stream is the Wal-la-khut; the eastern, half-way between the cape and Chinook Point, is the Wap-pa-loo-che. Two or three houses on the shore of the bay, and a saw-mill, are all that remain of the settlement once designated as "Pacific City". The bay was named in honor of Captain Baker, whom Broughton found anchored here in the schooner Jenny, of Bristol, when he entered. ... "
The 1862 U.S. Coast Survey "Coast Pilot" also lists the Chinook River as simply the "Wap-pa-loo-che". The 1889 U.S. Coast Survey "Coast Pilot" identifies the river as the "Chinook River" with "Wap-pa-loo-chee" in parentheses. 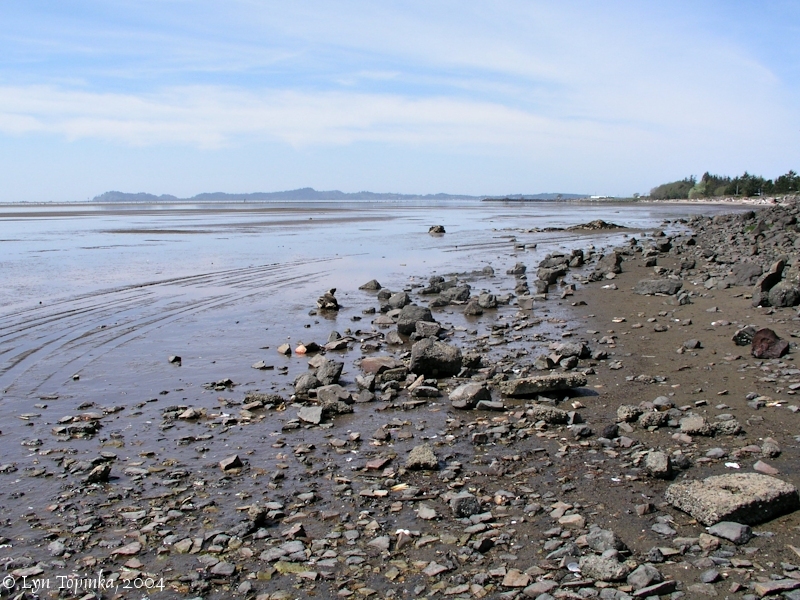 "... Baker's Bay -- This is the deep recession of the shore to the northward of Sand Island between the extremity of Cape Disappointment and Chinook Point. The western shore of this bay is the east side of the Cape for nearly three miles in a general northerly direction; thence the shore sweeps to the eastward and southeastward for six miles to Chinook Point. 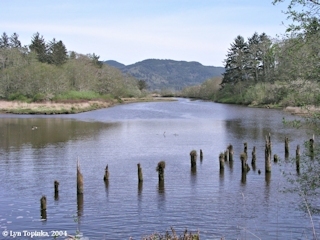 The latter stretch of shore is low, bordered by extensive marshes, and receives the waters of the Wallacut and the Chinook Rivers. The Wallacut River (Wal-la-khut) enters at the northernmost bend of the bay shore; it is a small stream coming through marshes from the direction of Shoalwater Bay, which it very nearly reaches. The Chinook River (Wap-pa-loo-chee) enters two miles farther to the eastward; it has more character of a slough, three or four miles long. ..."
"... Baker Bay is a shoal, open bight eastward of Cape Disappointment formed by the cape and the recession of the land northward. 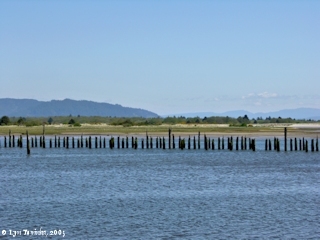 Sand Island, low, lies in front of the bay; a narrow channel immediately eastward and northward of the island leads to Ilwaco, a small town, the terminus of the railroad extending northward to Willapa Bay. The bay is full of shoals and fish traps, and the channel is not navigable at low tide even for light=draft steamers. ..."
"... Baker Bay is a shoal, open bight, eastward of Cape Disappointment, formed by the cape and the recession of the land northward. 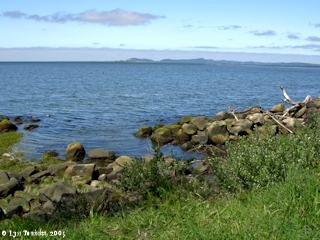 Sand Island, low and flat, lies in front of the bay. A channel redredged to 10 feet in 1939 lies eastward and northward of the island. In July 1942, the controlling depth was 8 feet. 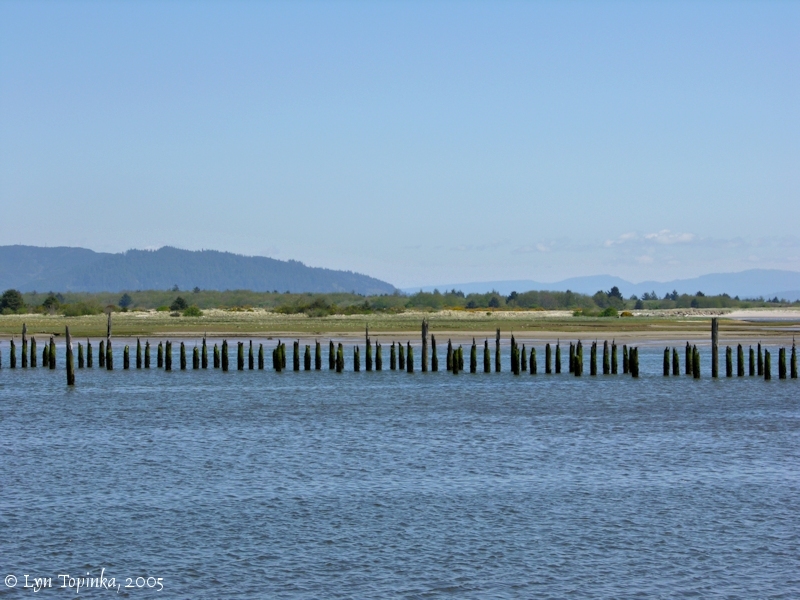 This channel leads to Ilwaco, a small town on the northern shore. ... Ilwaco is the base for a large fishing fleet. Fuel oil, gas, and water are available; there are facilities for hoisting out 8- to 10-ton fish boats on small marine railways and for making some repairs. There is another channel of shoal depths to the westward of Sand Island. 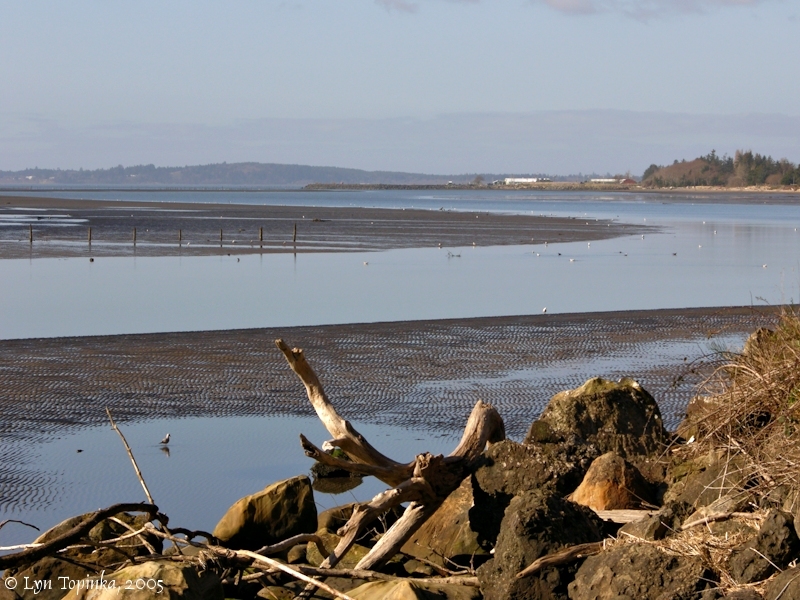 The remainder of the bay is covered with shoals and old, abandoned fish traps, and at low tide, is not navigable even for light-draft river steamers. ..."
The Chinook River is a small salmon bearing stream in Southwest Washington that flows into Baker Bay at approximately Columbia River Mile (RM) 6, three miles (as the crow flies) upstream of Ilwaco, Washington, and four miles (along the shoreline) from Chinook Point. Just downstream from the Chinook River is the Wallacut River. The Chinook Indians controlled trade on the Columbia from their village on the north shore; during the winter they migrated to Willapa Bay, protected from southwesterly storms. The name "Chinook" came from the Chehalis Indian name for the Chinook summer village, "cinuk." A hybrid version of the Chinook language came to be known as the Chinook jargon, the language of maritime and river traders. 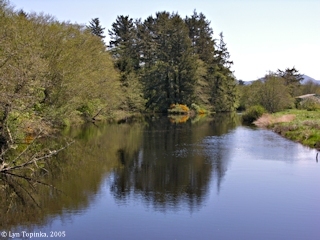 Click image to enlarge Chinook River, looking upstream. Image taken April 9, 2004. 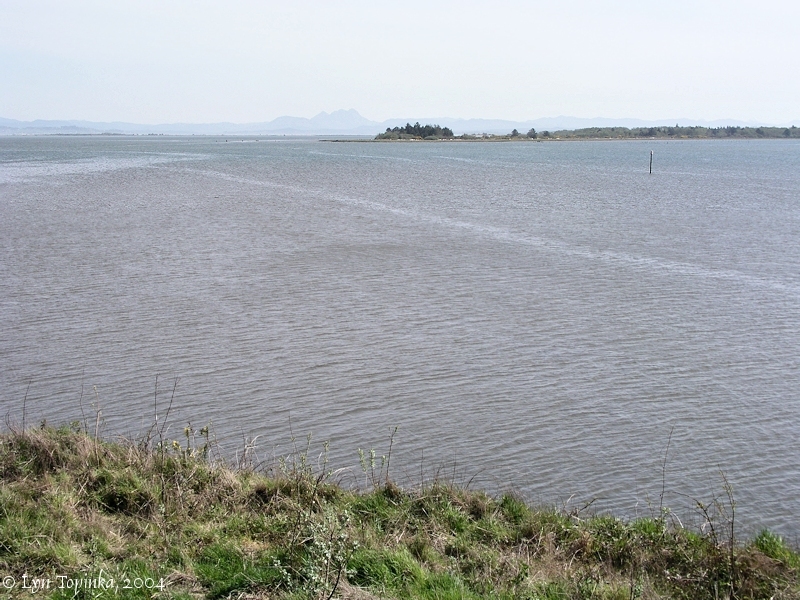 The mouth of the Wallacut River enters Baker Bay just upsream of Ilwaco, Washington. The Chinook River and Chinook Point are upstream. The name "Wallacut" is from the Indian "Walihut" meaning "place of stones". The north side of the river near its mouth is lined with small smooth stones. 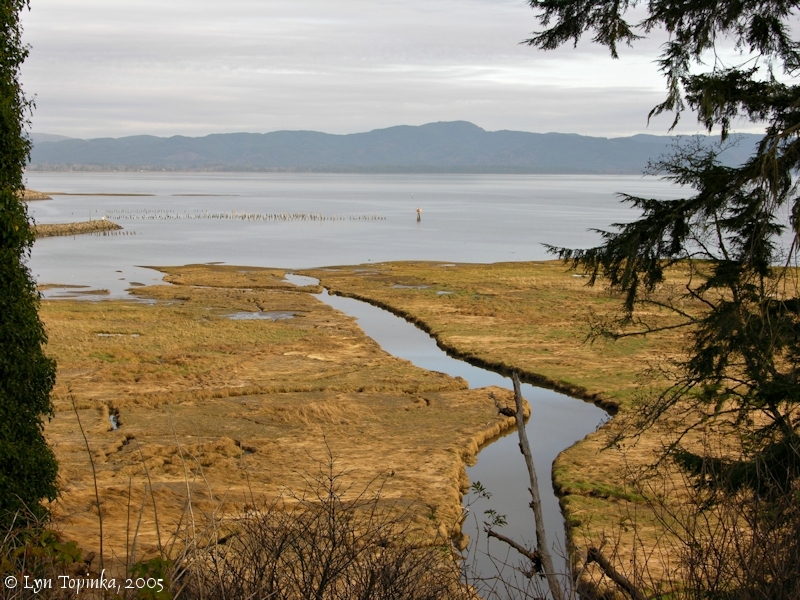 The Hudsons Bay Company used the short 3-mile stream as a portage to Willapa Bay. Click image to enlarge Wallacut River, Washington, looking upsteam. View from Stringtown Road Bridge. Image taken April 19, 2005.